Hello there and good morning! Here at Sasha Shangri-La, we had our first frost yesterday and so we are embracing the beautiful Fall season and dressing colorfully and wearing our cardigan sweaters or affectionally called, our cardis for warmth. A few random photos taken of the girls indoors and as they were lined up. Pretty blonde NP girls. They each have their own, unique look. A happy gathering of the early 1966 girls that share the same vintage. Chloe on the left was made in 1966 and Adeline on the right was made a year later. It is so nice to see the brunettes together to compare and contrast their features. Later, after the day warmed up, we went outdoors to take a few photos. Next is Tilly wearing her favorite dress made by Lorraine Tyler. Her cardi was knitted by Mary Anne Getchell and her lime green leather shoes were made by Jean Jensen. Next is my sweet Carney wearing a lovely dress made by Nikita. Her aqua sweater was knitted by Mary Anne Getchell and her peachy colored, leather shoes were made by Jean Jensen. Lovely Ellen is wearing a floral dress by Molly. It has a nice, full sash that ties in the back to make a generous bow. She loves this dress very much and wore it often last Fall. 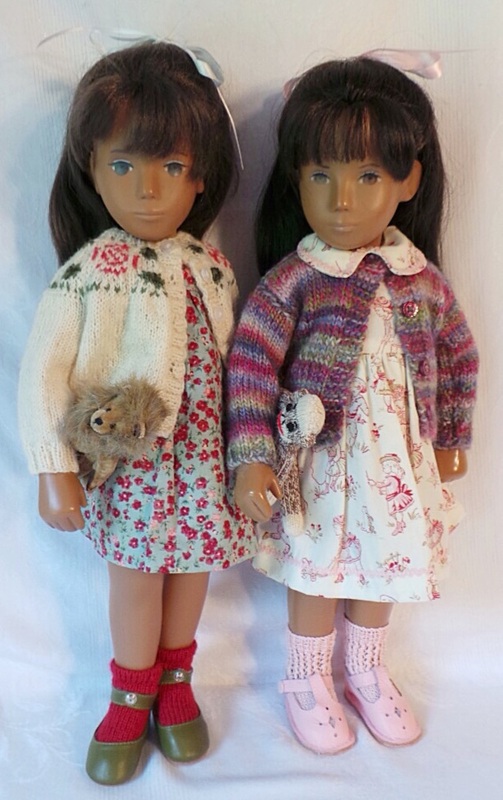 Her sweater also knitted by Mary Anne Getchell and her socks and leather shoes are from Ruthsdolls. Did you notice her blue bird pin? Sylvia is wearing a dress by Jadzia and sweater by Mary Anne Getchell. Her lovely knitted socks are made by Gillian Nash and her chocolate brown, leather shoes are by Sashapotamus. Chloe’s olive green, leather shoes are by Sashapotamus. EIGHT very pretty little maids in a row! What a magnificent NP collection with each one being so different and unique. (Unfortunately so many of mine have been now sold on as it was always slightly easier for me to move on one NP than try to find quite a few other dolls to meet the equivalent in cash.). Thanks for this Sasha treat! Hi Kendal and yes, there is eight, I must admit. Certainly, I must be at an end with NP acquistions! Thank you so much for the kind compliments about them. I agree they each are unique and endearing too. They all look adorable holding their favourite soft toy and wearing their lovely colourful cardigans and pretty dresses. What a treat. Very sensible as well to start thinking of dressing for the cooler weather… My girls all changed some time ago, but then we had some lovely warm weather. It is now cold though and the heating has just been put on! Gorgeous girls in gorgeous coloured cardis! Love love love the line up photo’s, there is something so nice about seeing a row of these wonderful dolls standing in a row in lovely clothing. Your lovely girls all look so happy to have such cuddly, warm cardies! I love the ones that have a variety of colors in them – so cheerful. Hi Ginger a sensational line up of NPs in their lovely cardis. i especially like the eye style of the 1967 girls. An NP is definitely on my wish list. I love them all Ginger, the way you have matched all the little cardigans with the dresses, the girls look so happy to all have their own individual style.